Hey, that tastes good! : Granola. Sorry. Again. Eventually I'll start posting regularly again. 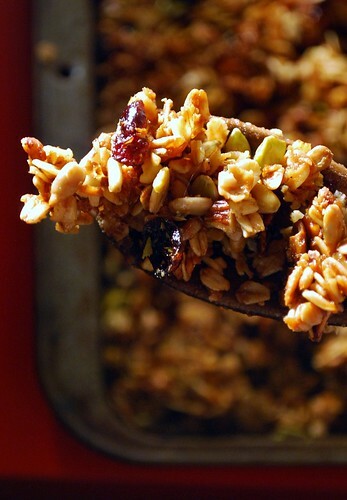 Who cares though, because this granola is banging. So delicious. This recipe was all over the internet this summer, and I made it then, but ate it all so fast I didn't get any pictures. Yum yum. 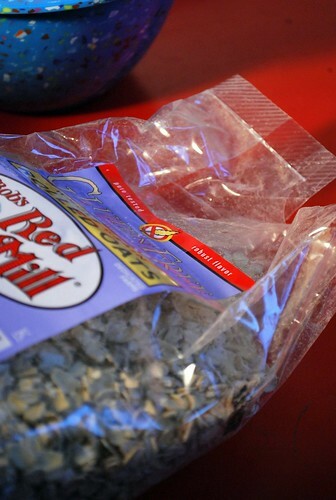 Don't forget that not all oats are gluten free, I used Bob's Red Mill because I can find them sometimes. Preheat oven to 300. Mix together everything except the fruit, stir well, and spread onto a cookie sheet. Bake 40 minutes, stirring every 10 minutes. Once it's done, stir in the fruit and let cool, stirring once or twice. Eat with yogurt, or ricotta and berries, or just eat it straight like I do. This looks yummy. I sure have been missing your posts and I will eagerly await the time when you are able to post more often! I've been so curious about the olive oil granola. Did you use a specific olive oil? This looks perfect! This look so good- packed with all kinds of yummy things! I can't wait to try it. I made that too! I can attest to it's addictiveness. YUM! Yours looks good, and reminds me I need to make it again! I think I'll try to make this as low carb as possible. Then I can enjoy it. I love this recipe! I linked to it on my new blog at http://superceliac.com! Hope that's ok! I made this twice over Christmas and it was a big hit. I bagged it up and gave it as gifts and also had lots for my family. The second time I made it I used a 9x13 pan instead of a cookie sheet and allowed it to cool in the pan. The result was huge, gooey chunks, almost like granola bars. 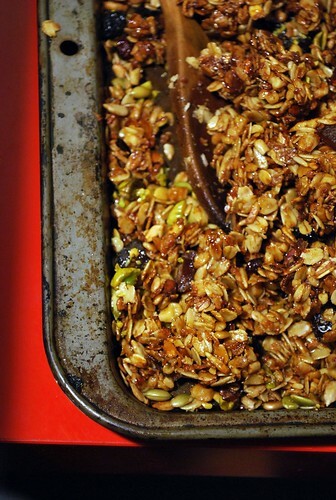 If you like the gooey kind of granola, making it in a pan is the way to go.